Technology has always been a part of human society and has helped us shape society into what it is today and gender has always had a large influence on the development of technologies and previous studies have focused on the masculine hegemony that exist in society and therefore as well in technology. With the rise of the information age various new technological innovations have taken a place within our society and gendered digital assistant applications (DAAs) like Apple’s Siri have added another layer of complexity into studying technology in relation to gender. This because these technological artifacts can no longer be approached as gender-neutral objects and in the same way gender influences human-to-human interaction, it also influences the understanding of and interaction of users with these technologies. These technologies open up many new academic opportunities to study technology in relation to gender and being the first stepping-stone towards artificial intelligence in our society, it is important to study these changes from the beginning. The aim of this exploratory research is to uncover how users construct meaning of gendered DAAs and how this process is influenced by gender. Therefore the following research question and sub-question were formulated: How do users construct meaning of gendered digital assistants applications? 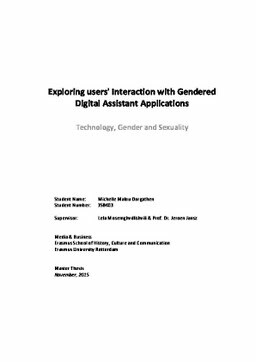 And, How is the construction of meaning of gendered digital assistant applications influenced by the gender of the users? The exploratory nature of this research urges for a qualitative approach that helps to highlight subjective experiences of individuals and therefore the method of focus groups was used. A total of 20 individuals participated in four focus groups; a heterosexual mixed-gender group, homosexual mixed-gender group, a bisexual mixed gender-group and a mixed-group, each consisting of 5 participants in total. All of the participants were selected using a questionnaire and were required to use a gendered DAA called Assistant prior to the focus groups sessions. The focus group sessions were transcribed and analyzed using the constant comparison and keyword-in-context approach. The main findings of this research suggest that users create meaning out of gendered digital assistant applications through experimentation with DAAs, previous technologies, society, gender stereotypes and artificial intelligence in science fiction. It is clear, however, that this construction of meaning is difficult for many users due to the novelty of DAAs. Gender does not directly influence the understanding of the users, but indirectly influences the understanding of the previous mentioned concepts. Keywords Gendered Technologies, Gender, Artificial intelligence, Digital Assistant Applications, Social Shaping of Technology.